Spread mustard on the steak. Cut steak into strips about 1½ inches wide. On each strip, put a small piece of bacon, and several thin slices of pickle. Sprinkle with garlic salt, pepper, and paprika. Roll up each steak strip tightly, and secure with 2 toothpicks. Dust each piece with flour, salt and pepper. In a large deep skillet, heat enough oil to cover the bottom by ½ inch. Brown beef roulades in batches, removing the browned roulades to a plate. In the same skillet, sauté the onions for a minute or two to soften. Add wine and stir up any browned bits in the skillet. Return roulades to the skillet and add beef stock. 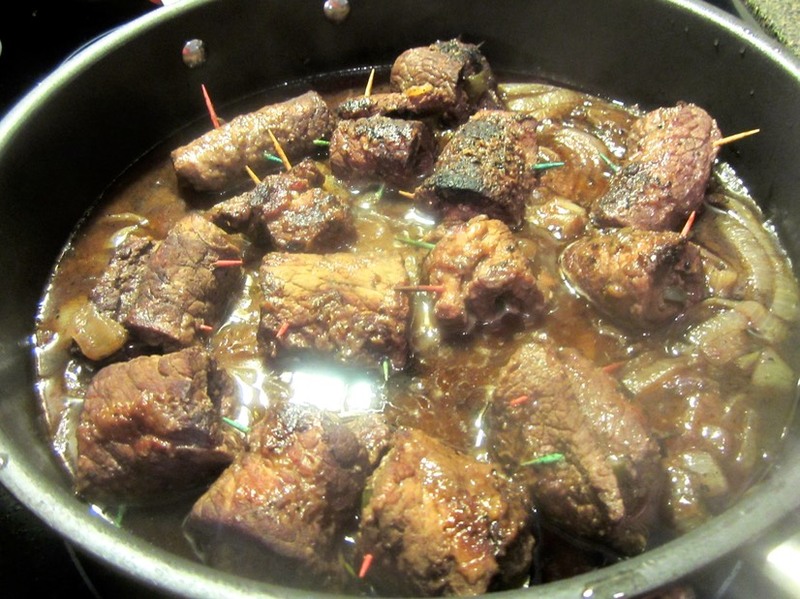 Cover and simmer over low heat for 1½ hours, or until very tender, adding more wine or stock if necessary.